Blackpool Illuminations is a world renowned festival of light founded in 1879 (a year before Thomas Edison patented the electric light bulb) and held each autumn on the Fylde coast in Lancashire. Stretching over six miles of Blackpool’s famous promenade, from Starr Gate to Bispham, the Illuminations are a remarkable sight to behold. VisitBlackpool once described Blackpool Illuminations as “the greatest free light show on earth” and with over 3.5 million visitors now flocking to the resort to enjoy their colourful glow they might be right. Working as a photographer in Blackpool who lives locally in nearby Lytham St Annes I have the pleasure of photographing this spectacular Lights Festival each and every year. You may remember a photograph of an illuminated ‘Life Without Limits’ Blackpool tram with the Pleasure Beach in the background which I tweeted back in October 2012. The best way to enjoy The Lights, in my opinion, is to walk or cycle rather than drive along the promenade. That way you can see all the Illuminations close up and admire the finer details of the display. Recently I headed to the Tableaux section to photograph my favourite Blackpool Illuminations displays. This tableaux entitled Four Seasons is one of my favourite Illuminations brightening up the promenade in Bispham simply because of the brilliant facial expressions! You may recall seeing one of these in the Walls Have Voices series in which I photographed ‘ON: A Re-imagining of Blackpool Illuminations’ by Brian Griffiths at the Grundy Gallery. While photographing this street art tableaux I waited for a tram to come past so I could capture it’s light trail. I think the result is rather pleasing and adds another dimension to the photograph. I’d love to find out more about the artist(s) who made this Illuminations so if you know anything please leave a comment at the bottom of the page. What I like about this photograph, besides the Illuminations itself, is the neon light falling on the pathway and the slight detail in the fading twilight sky. I think the display either side of the Queen & Crowns is called Animal Antics, but I maybe wrong. Please feel free to correct me! 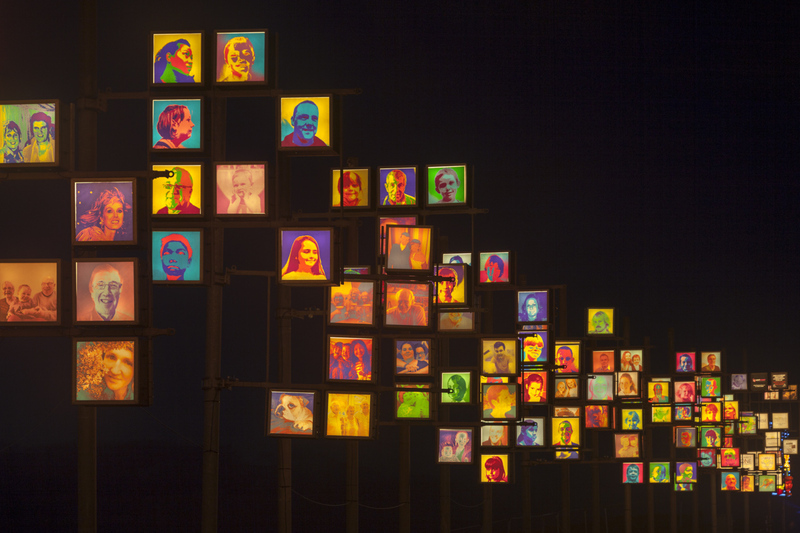 There’s no missing this wonderful Blackpool Illuminations display entitled Local Heads by Andy McKeown. It features photos of local people which are turned into 1960s inspired pop art images and mounted onto light boxes by Andy himself. Did you know that you can feature in the 2015 Local Heads project? When you get a minute take a look at VisitBlackpool where you can book your space. 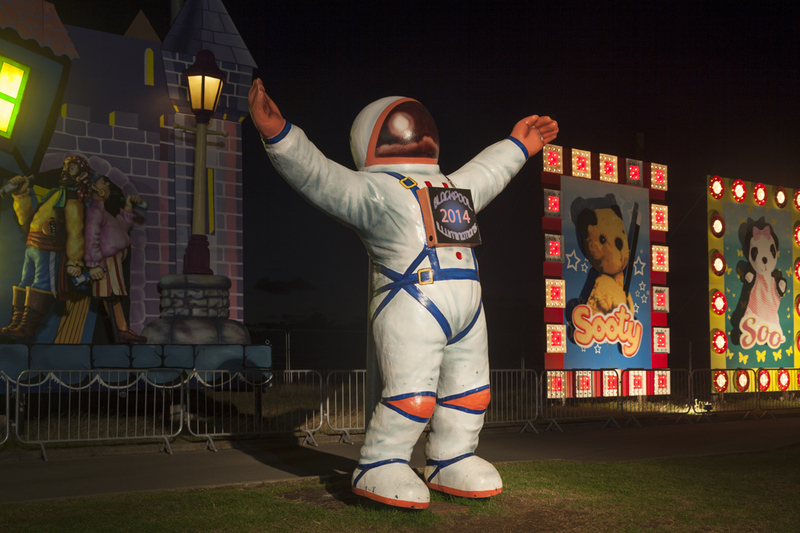 Where else could you see pirates, an astronaut and childhood favourites Sooty & Soo all within the same view? Like the Great Wall of China, The Illuminations can be seen from space. Forty-five staff work all year round to ensure the displays are ready on time. 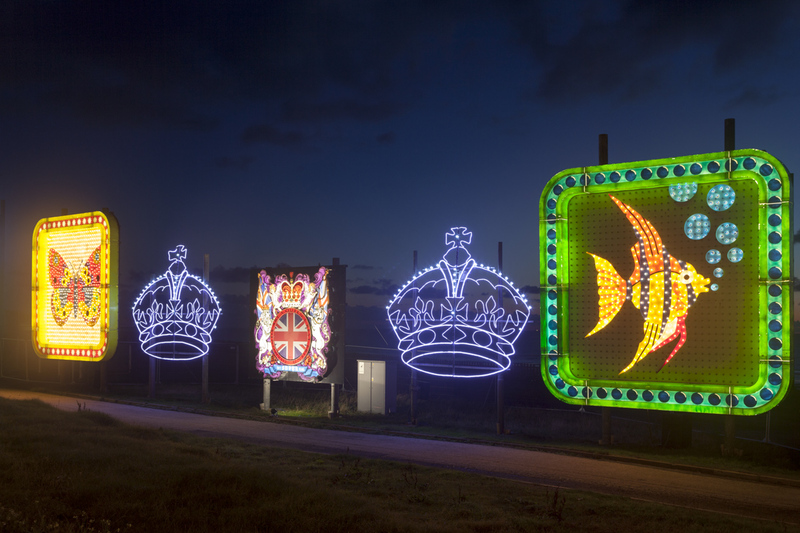 The Illuminations are expected to attract over 3.5 million visitors to Blackpool. From Starr Gate to Bispham, Blackpool Illuminations cover almost six miles of the promenade. 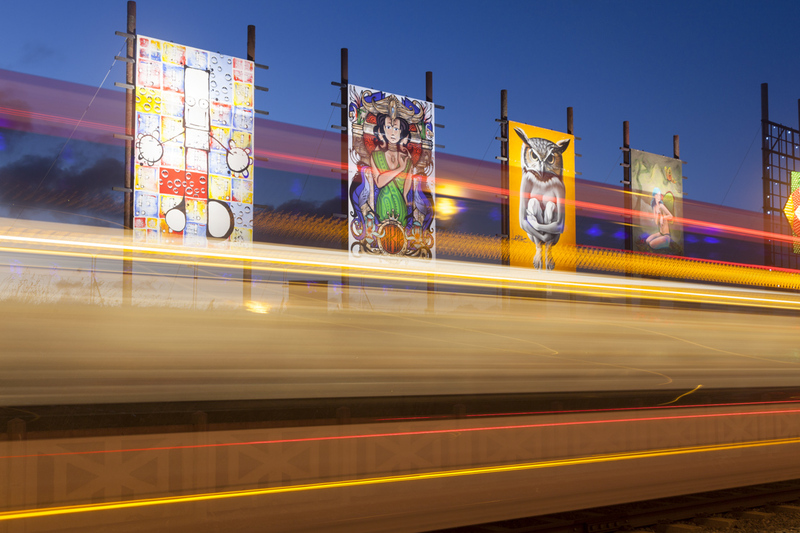 The Lights will shine non-stop for 66 nights between 29th August – 9th November 2014. 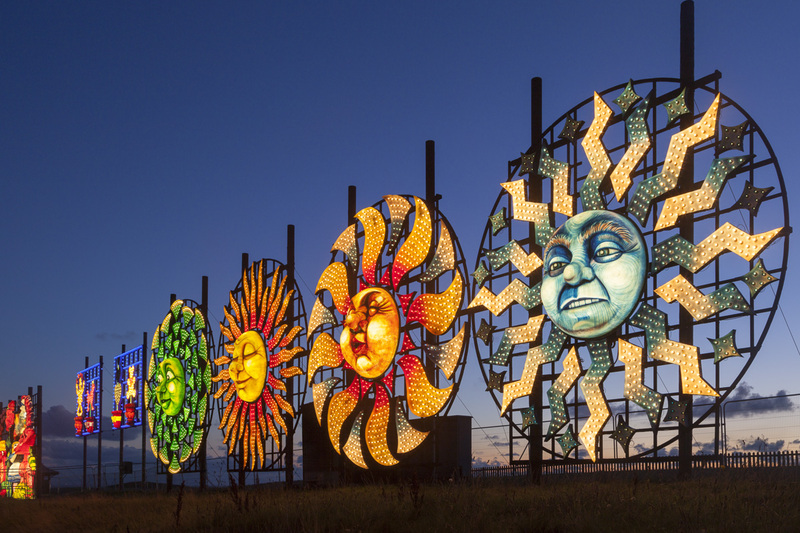 There are more than five hundred scenic designs and features in this years annual festival of light. One million lamps in various types and styles make up this dazzlingly display of light. The equipment used for the Blackpool Illuminations weighs the equivalent to 350 Blackpool trams. Forty large tableaux which cover more than 5,000 square metres are included in the display. Blackpool Illuminations 2014 cost £2.4 million to stage. Have you seen Blackpool Illuminations this year? What did you think? Please leave your comment or links to your photographs below, I’d love to see them. If you like my photographs of Blackpool Illuminations 2014 please share this blog post with your friends and followers. This entry was posted in Blackpool and tagged Blackpool, Festival of Light, Illuminations, Lights, Promenade, Switch On, Tableaux.